For other uses, see Castac (disambiguation). 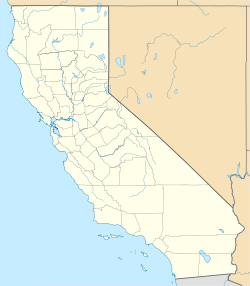 Castaic Junction is an unincorporated community located in Los Angeles County, California. It is located at the crossroads of Interstate 5 and State Route 126 at the Santa Clara River. Places in Castaic Junction carry a Valencia address, and it is adjacent to the City of Santa Clarita. Castaic Junction is the location of the Magic Mountain theme park. Castaic Junction was the official southern end of the Ridge Route. The name dates to 1887, before highways were built, when a railroad siding was set up at the junction. The community had an Art Deco−Moderne style train depot, serving the railroad line that ran along the Santa Clara River between Saugus and Piru. The depot was demolished around 1990. 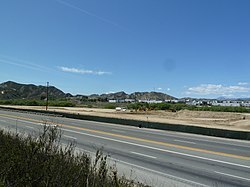 Just beyond the north end of the Magic Mountain parking lot is the site of the adobe ranch house for the historic Rancho San Francisco, a Mexican land grant that encompassed the Santa Clarita Valley from Piru to Canyon Country. According to local legend, icon James Dean ate his last meal at the Tip's Restaurant formerly at the crossroads of Highway 126 and The Old Road before he drove on north. ^ a b "Castaic Junction". Geographic Names Information System. United States Geological Survey. ^ a b "SCVHistory.com AP2221 – Castaic – Castaic Junction Train Siding". Retrieved 6 February 2016. ^ "Castaic Area History". Retrieved 6 February 2016. ^ "SCVHistory.com – Rancho San Francisco: A Study of a California Land Grant, by Arthur B. Perkins". Retrieved 6 February 2016. ^ "SCVHistory.com – Castaic Junction: James Dean's Last Stop Before Immortality?". Retrieved 6 February 2016. ^ "SCVHistory.com LW2148 – Castaic Junction – Tip's Restaurant Matchbooks". Retrieved 6 February 2016.